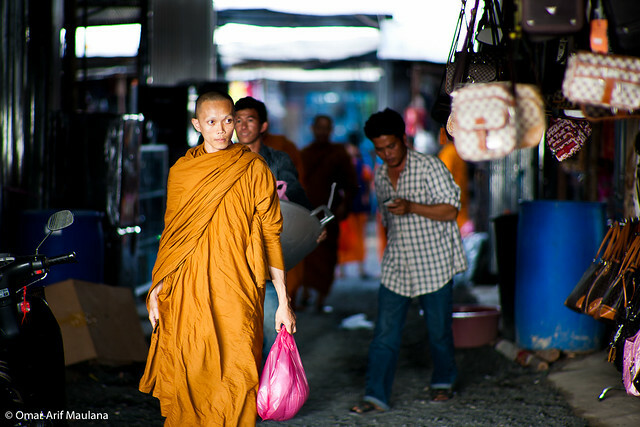 These photos are taken during my recent trip to Surin, Thailand. I took the shots when I visit the local market, near the border to Cambodia. When I think of monk, I think of people who live in seclusion, far away from civilization, praying in the mountains (they do, actually). 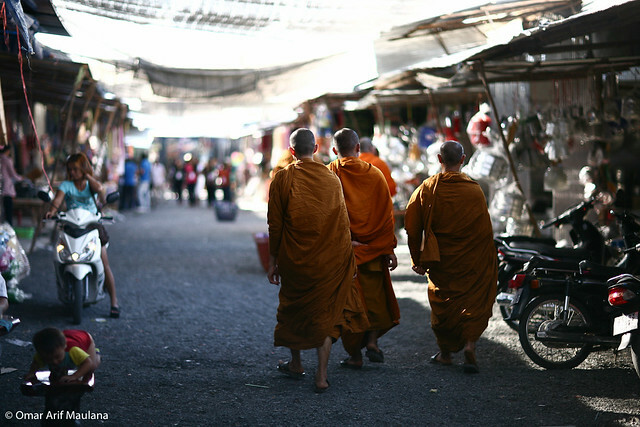 But what I see here is a group of monks, shopping for merchandise, and supplies for their temple. I find them to be very shy actually, especially the older ones. When I raise my camera, they turn their heads away shyly and sometimes I can see they're upset from their expressions. It's quite difficult to take their candid shots. I was quite afraid to take their photo actually, afraid they would curse me or something. So, at first I took some shots from behind. 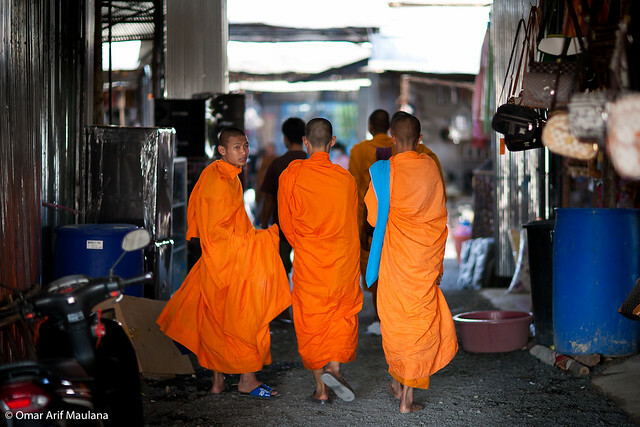 a group of monk pass by, this time the younger ones. I was lucky to get this shot, I guess he didn't realize that I was standing there. You can see on the background there is a man carrying a huge pan for him, and the guy that's holding a phone is his driver I guess. gila mar, keren banget mar keren. pecah pala gw mar. "When I raise my camera, they turn their heads away shyly and sometimes I can see they're upset from their expressions. It's quite difficult to take their candid shots. I was quite afraid to take their photo actually, afraid they would curse me or something. So, at first I took some shots from behind. "- It's kind of impolite or even rude, to take pictures of strangers without asking, so better just ask first. Just that. No offense. Nice pictures. I get your point, it was a mistake on my end. I was nervous and wasn't smiling at all that time.